This image taken with the NASA/ESA Hubble Space Telescope provides a detailed look at the tattered remains of a supernova explosion known as Cassiopeia A (Cas A). 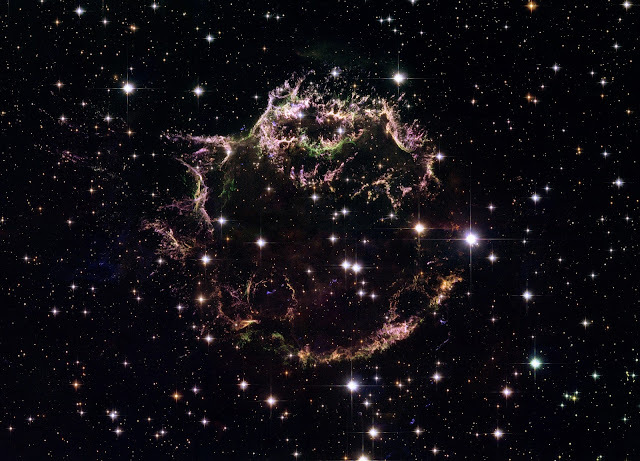 It is the youngest known remnant from a supernova explosion in the Milky Way. The Hubble image shows the complex and intricate structure of the star's shattered fragments. The image is a composite made from 18 separate images taken using Hubble's Advanced Camera for Surveys (ACS), and it shows the Cas A remnant as a broken ring of bright filamentary and clumpy stellar ejecta. These huge swirls of debris glow with the heat generated by the passage of a shockwave from the supernova blast. The various colours of the gaseous shards indicate differences in chemical composition. Bright green filaments are rich in oxygen, red and purple are sulphur, and blue are composed mostly of hydrogen and nitrogen. In the latest observing campaign, two sets of images were taken, separated by nine months. Even in that short time, Hubble's razor-sharp images can observe the expansion of the remnant. Comparison of the two image sets shows that a faint stream of debris seen along the upper left side of the remnant is moving with high speed - up to 50 million kilometres per hour (fast enough to travel from Earth to the Moon in 30 seconds! ).